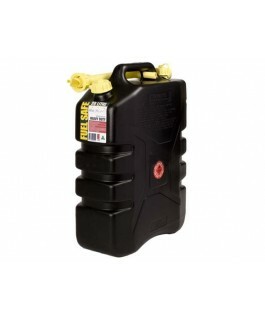 Additional fuel capacity is essential for any four wheeler heading offroad into remote and isolated areas. Hard going track conditions can have a big impact on fuel consumption. Also extremely long distances between fuel stations can catch the standard four wheel driver short and at worst leave them stranded with no fuel. We stock a complete range of long range, slim line fuel tanks, jerry cans and fuel accessories to ensure you can carry enough fuel required on long road trips. Choose from 25 litres up to a whopping 160 litre tank. Colour: Yellow Capacity: 20 Litre Constructed from a high-density polyethylene plastic, these FUELSAFE containers are specifically coloured for diesel fuels. Made in Australia Constructed from high strength polyethylene Lightweig..
Colour: Black Capacity: 20 Litre Constructed from a high-density polyethylene plastic, FUELSAFE Heavy Duty Professional fuel containers represent an extra heavy duty solution for industrial operators, contractors and the 4WD enthusias..